Yurusen points out the clock and suggests he turn the hands back. 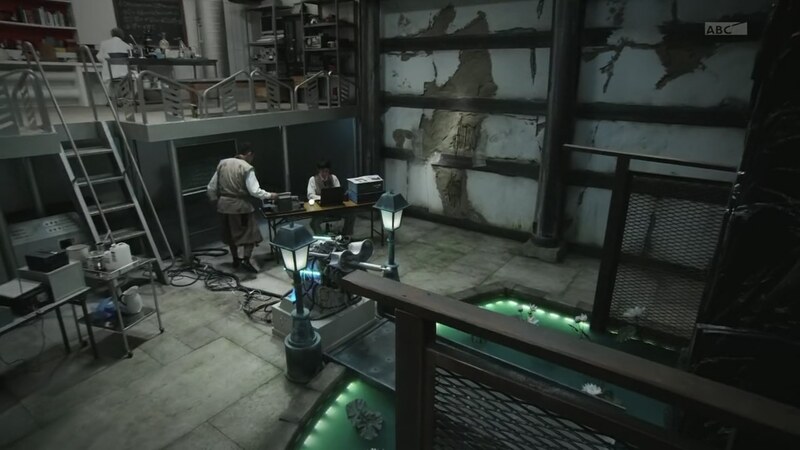 That shows Onari and Akari being taken to some warehouse which Takeru asks the clock to take him to. Saionji orders two Ganma to take control of Onari and Akari’s body, but Takeru arrives just in time to prevent that from happening. They head home. At the cemetery, Saionji finds Makoto again at Ryuu’s grave. Makoto assures Kanon that he will revive her. But she advises him to not be reckless. Saionji approaches them and Kanon says he is not to be trusted. Saionji asks Makoto to hear him out. He explains that ten years ago, [they] were looking for a way to connect the monolith to the Ganma world. Ryuu wanted to use a live test subject, but Saionji says “we” opposed that plan. “We” thought Ryuu gave up, but then the so-called accident happened which sucked Makoto and Kanon into the Ganma world. Saionji says the monolith wouldn’t activate unless someone flipped the switch. Saionji asks Makoto if he looked up to Ryuu, but he says it doesn’t matter now. Despite Makoto warning him earlier, Saionji again mentions Kanon and says what a pity it is for her to be in this state. Makoto grabs Saionji by the collar while he continues saying what he wants to say. 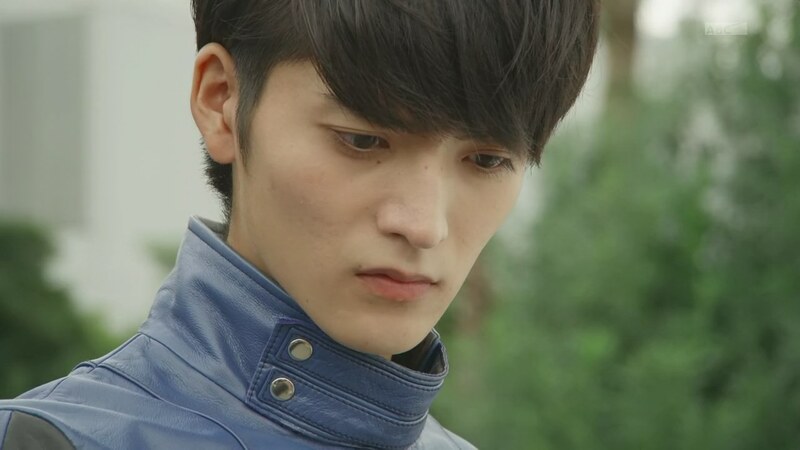 He tells Makoto that Takeru has five Eyecons and at this rate, he will be the one that revives, not Kanon. Makoto says he won’t let that happen. 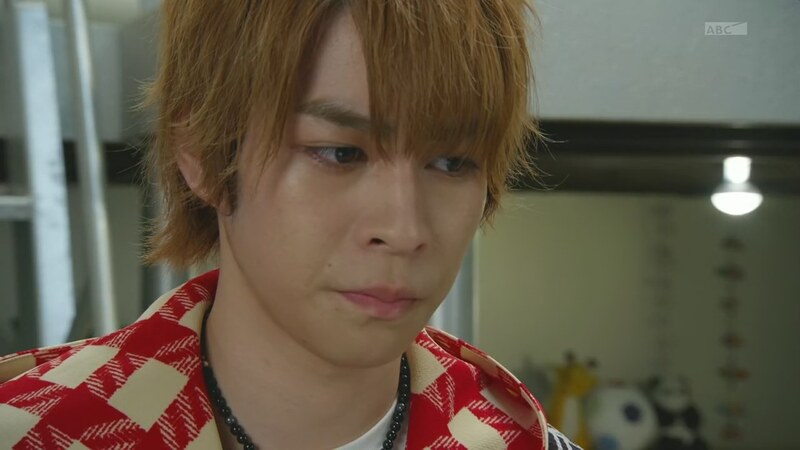 But Saionji doubts that Makoto would be able to strike Takeru down because of their past. He calls Makoto naive, but Makoto assures that he will do what he has to. Makoto leaves. Saionji opens his handy Bandai Eyecon carrying case in which he already has five Eyecons. With Takeru’s five and Makoto’s four, there is only one needed to complete the set. 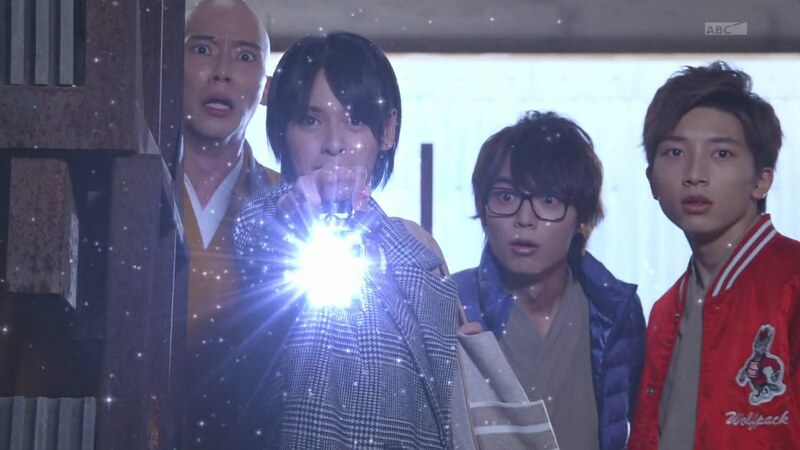 Takeru, Onari and Akari believe everything’s fine. But Tsuneo comes in and asks why Tomonori wasn’t with the other residents. Takeru apologizes for not double-checking. Akari, Onari, Shibuya and Narita decide to help look around. 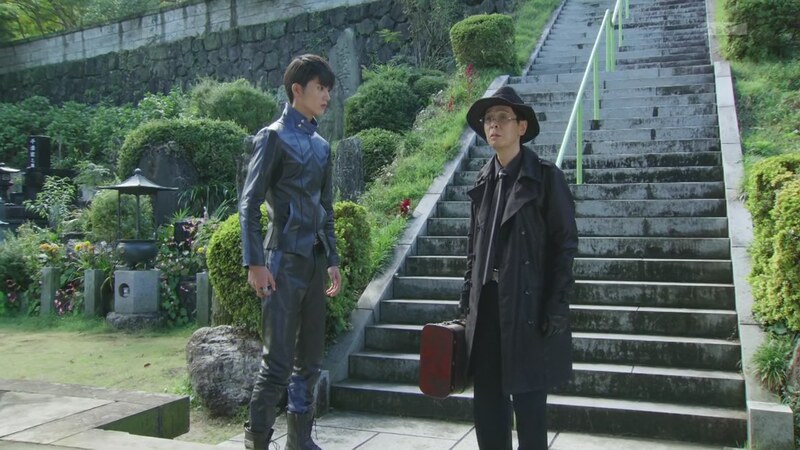 Takeru takes Tsuneo to where he last saw the residents walking toward. Tsuneo says there’s an old factory up ahead where he and Tomonori used to play at. 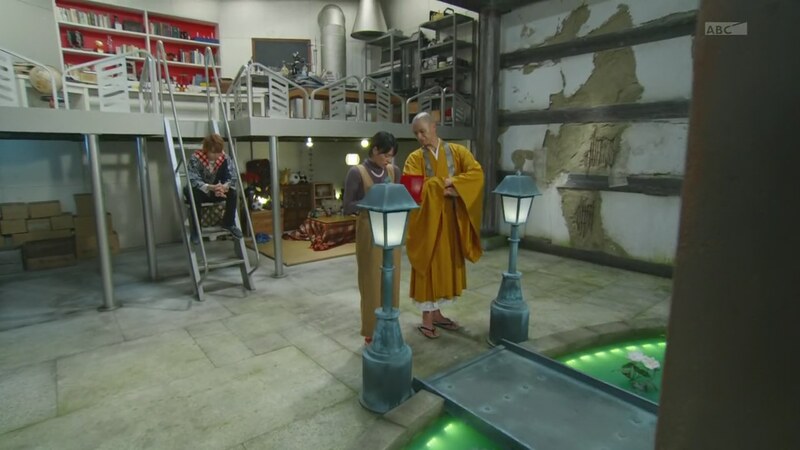 They decide to check it out and Takeru gives Akari the location. But Makoto appears. Takeru tells Tsuneo to take cover. But he decides to go on ahead to the factory. Takeru says he has no time to play with Specter right now. 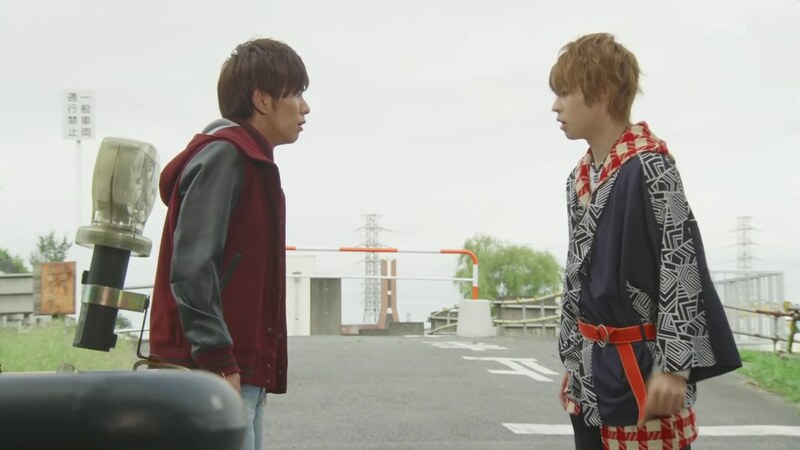 But Makoto bluntly confronts Takeru about whether or not he knew what his father was researching. 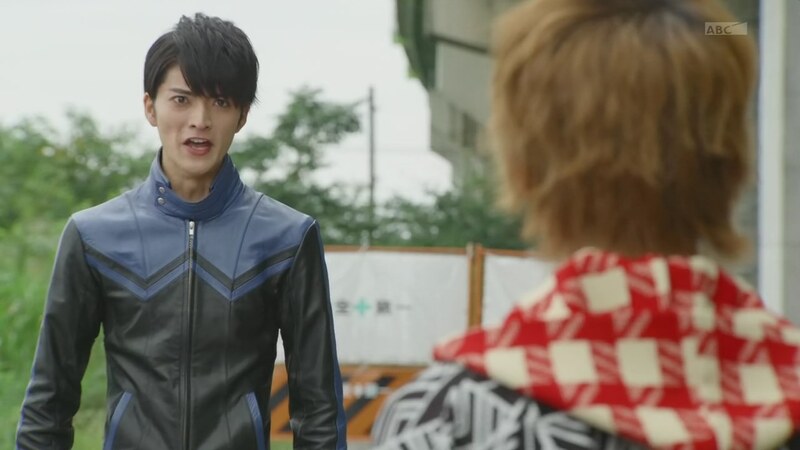 Makoto-niichan henshins to Nobunaga and charges toward Takeru who also henshins. 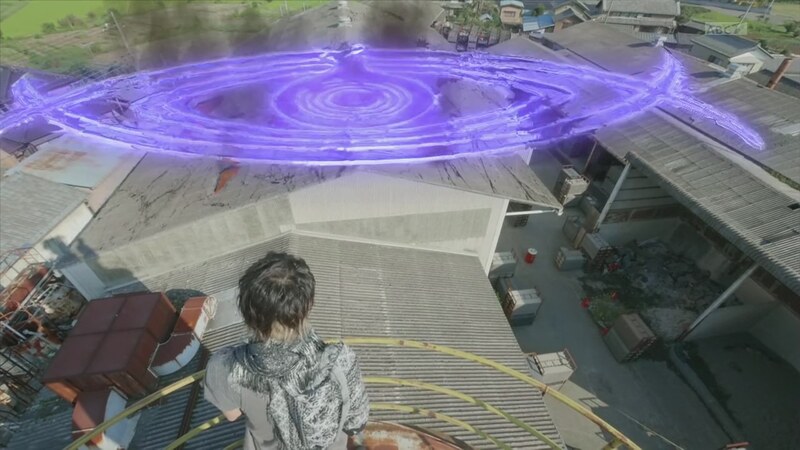 They take their fight to the Toei junkyard where Takeru tries asking his Makoto-niichan what’s happened to him these last ten years. Makoto merely shoots at him and forces Takeru to go Musashi. 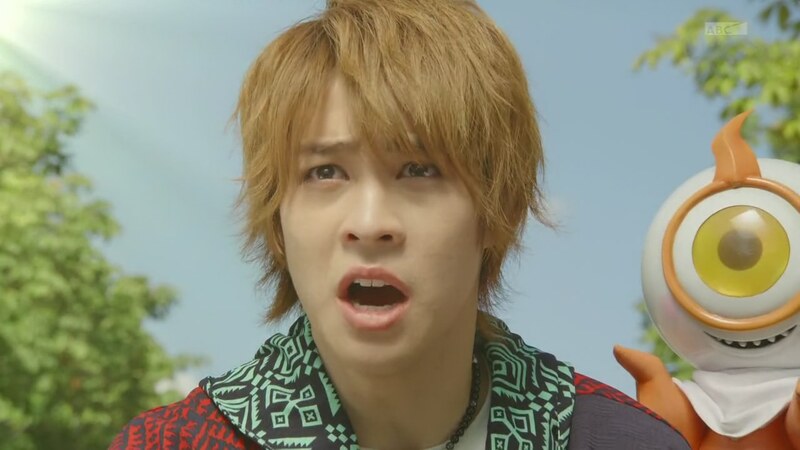 Takeru says he’s been worried about his niichan, but Makoto says he’s just forgotten about him. No! Takeru says and proceeds to ask about Kanon. 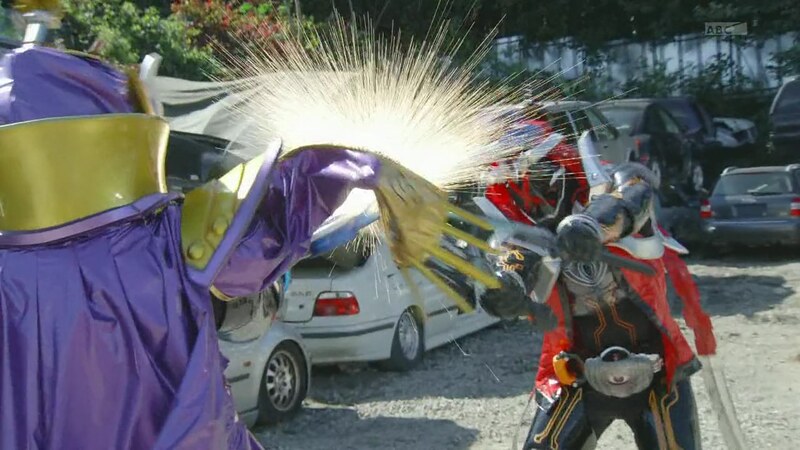 That angers Makoto even more and he unleashes an Omega Spark which forces Takeru to downhenshin. Makoto says he has no friends. But Takeru tries reminding him about them playing together as kids. Makoto says he’s doing what he must, this is his purpose in life. 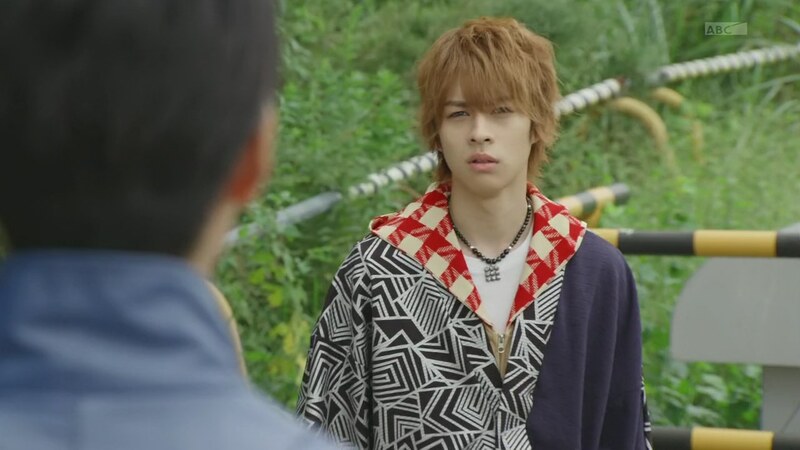 When it appears there’s no getting through to his niichan, Takeru goes Newton and retreats, much to Makoto’s frustration. But Aran likes seeing Makoto this emotional. 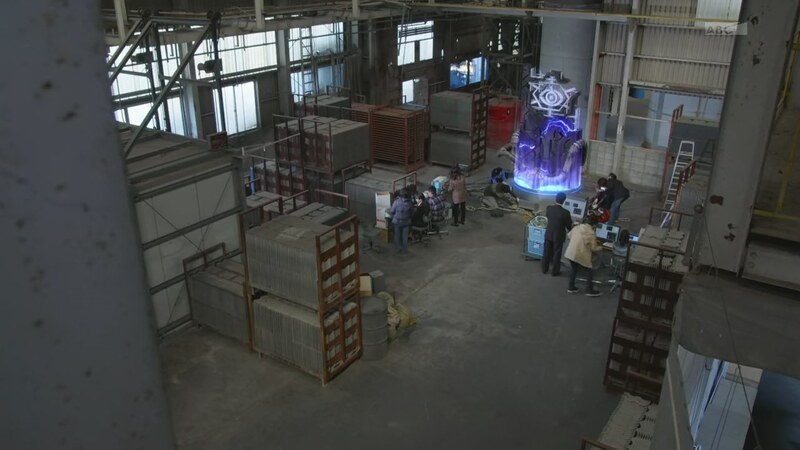 Meanwhile, Onari, Akari, Shibuya and Narita are at the old factory where they find Tomonori and others working on another monolith! They decide to wait until Takeru arrives, but Tsuneo just walks in and tries to get his best friend to snap out of whatever’s overcome him. Tomonori just knocks Tsuneo down and orders the bee Ganma from earlier to get rid of him. Before that can happen, Takeru arrives and shoots at the Ganma who lets go of Tsuneo and releases the other people from Ganma control. Tomonori tries running, but Tsuneo grabs him from behind. Takeru draws an eye and releases the Ganma from Tomonori to destroy it. That brings Tomonori back, much to Tsuneo’s relief and joy. 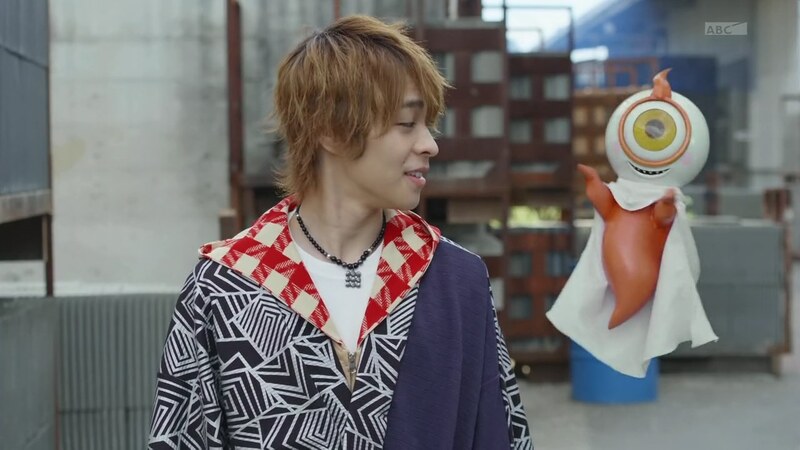 Takeru turns his attention to the Ganma. Akari uses Spider Lantern to make them visible and it’s the first time Shibuya and Narita have seen the action live and in person. Takeru goes Billy the Kid. The Ganma turns herself into a swarm of bees again, but Takeru notices there’s one queen bee he should focus on. Takeru calls on Spider Lantern which sprays a web that traps the Ganma and forces her back into her whole form. That allows Takeru to take care of her for good. But suddenly an explosion rocks the factory. The monolith has been destroyed. Tsuneo confirms his best friend Tomonori is really, truly back. Yurusen pops in and says that’s good because if a Ganma controls a person for more than 99 days, the possession becomes permanent. 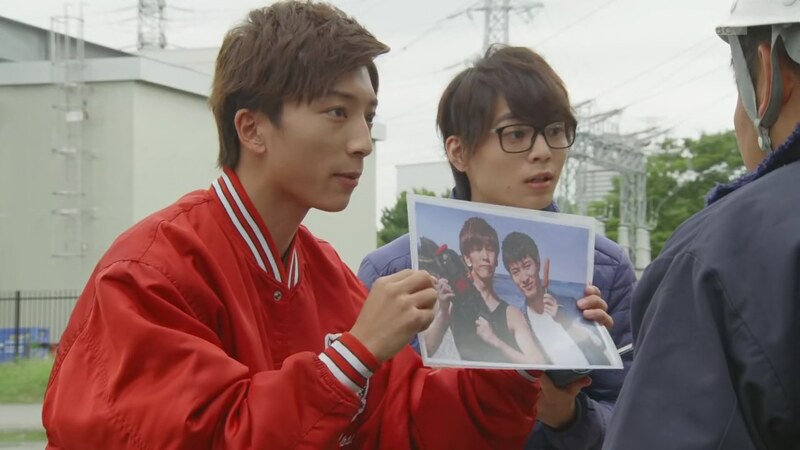 Tsuneo again thanks Takeru for his help and says he hopes Takeru too will find his missing childhood friend. 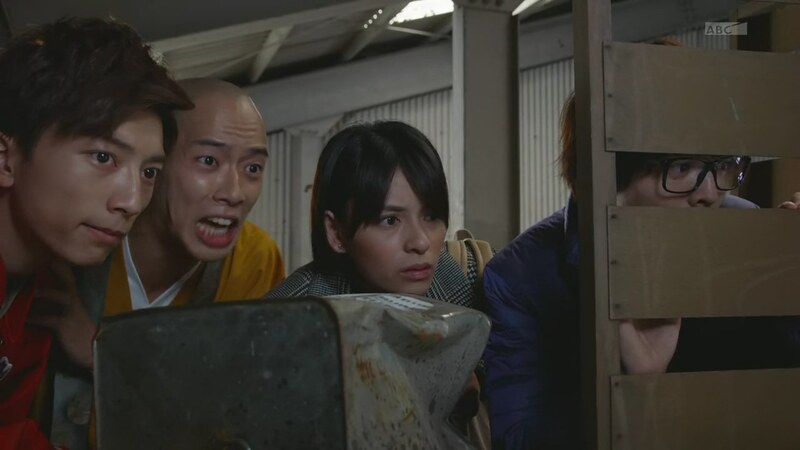 Back at the lab, Onari and Akari are standing in front of the monolith, wondering what it is really for. Akari hopes to crack the lock on the database. Takeru decides to drop the bomb on Akari. Specter is Makoto-niichan. Alright, that was a good episode. I still kinda feel like the big reveal of the Makoto-niichan part of the story was anticlimactic. As was more exposition from Saionji and him popping out his Eyecon case. I feel like they could’ve built up the tension more with both plot points. But now that it’s out in the open, I guess we’re moving back into unknown territory with what the monoliths actually are and why anyone would want to build a bridge to the Ganma world. And maybe Ryuu being a bad man or something. Also, with only 27 days left for Takeru, I don’t think we’ll even reach the halfway point of the season before that countdown is done. Especially since 14 Eyecons are already accounted for. 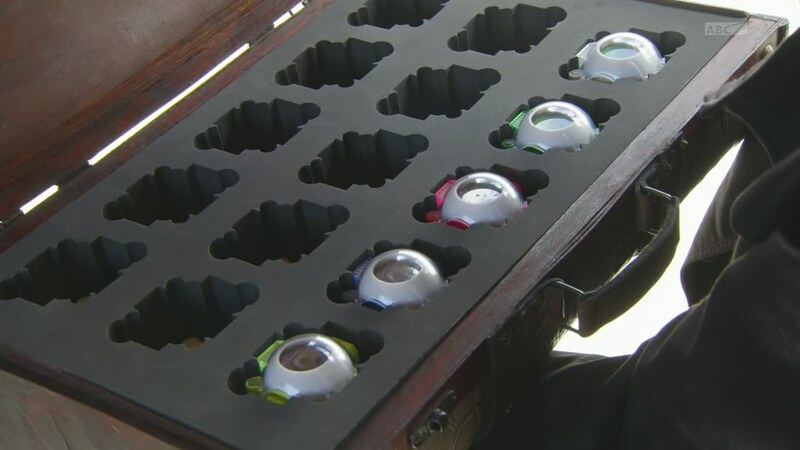 Speaking of, are there only 15 Eyecons? I thought there’d be an unlimited number of Eyecons since they could conceivably come up with any “icon” or hero or luminary who ever lived. So I assumed that “Woohoo! Enough Luminary Eyecons for everyone!” But the way Saionji put it, there only seem to be 15. Of the hero kind I guess. Which I don’t understand since of course, the main reason this show exists is for toys. And I know Bandai would never just cut off a possible toy line when they could milk it for all they can. It’s a convenient plot point I guess. But when their definition of “hero” is very loose, you’d think they’ve have plenty of the Eyecons to go around. Anyway, I was amused by the scene of Akari making sure Onari was Onari. It was a little scene that showed the three of them are very close. And like I’ve pointed out in recaps of other shows, it is important to establish such bonds to give you the viewer at least one reason to care about the characters. 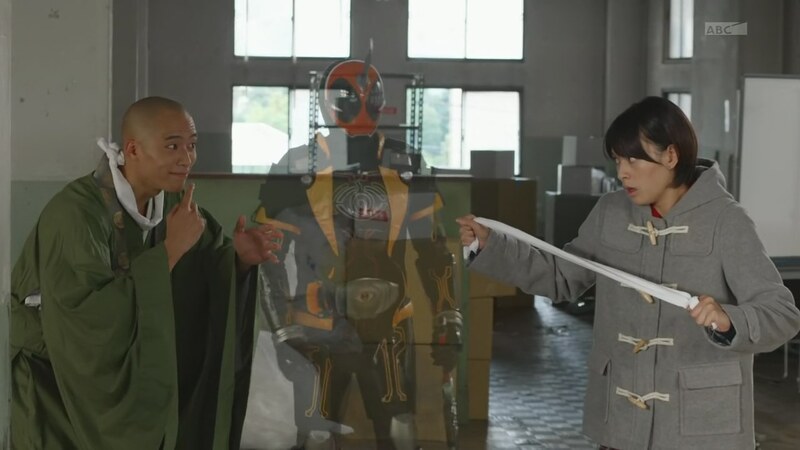 Interesting to see it wasn’t just Saionji and Papa Takeru playing with ghosts. So who could that guy be? Interesting. Overall, a good, solid episode. ← Recap: The Amazing Race 27, Episode 11 – "We're going to get our money's worth of entertainment here, I think." 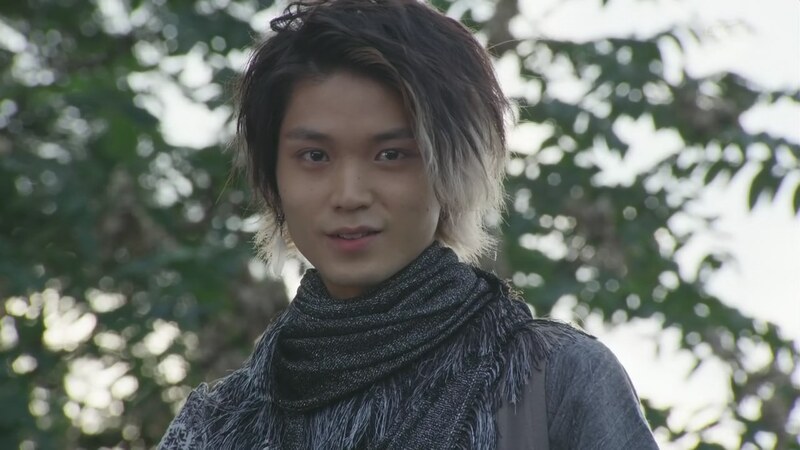 The thing that worries me is that Papa Ryuu would end up becoming Banno 2.0 in that they just tease and tease about his supposed “evil” intents and then try to cram in everything in the last quarter or so. Though it seems they are going to explore this much further than what Drive did with Banno’s story. As for why there are just 15 eyecons, I guess this is kinda similar with Kamen Rider Blade and why the heck were there just 52 undeads (just enough to fit them into the series’ 52-card deck theme) or why the hell are there just 108 roimudes in Drive, you just have to roll with it. Of course, there are other KR series that did have a better explanation of the limited number of monsters/collectibles they have. Though if we want to go more into it, maybe the 15 eyecons where already preselected by Saionji. Ryuu, and Hermit for whatever plans they have.